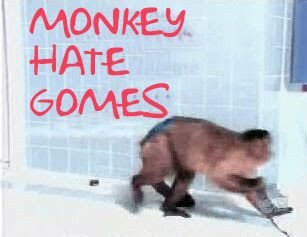 Welcome to Monkey Hate Gomes. Our first podcast is in the making. We hope you will come back later and listen to the show. It will be available on iTunes and .rss feeds. You can subscribe, meaning the show will automatically download to your computer, via the links to the right or search for us in iTunes directly. My reactions are limited to funny, interesting, and/or cool? What if my initial reaction was OMG, or consternation? How might I express such a reaction!